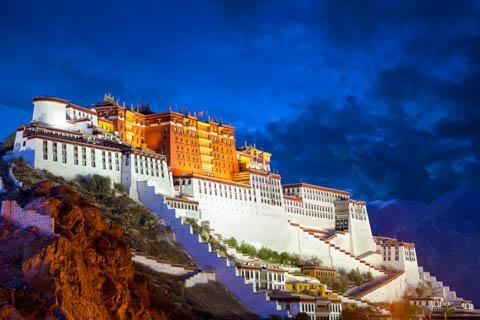 How much does it cost to travel to Lhasa? How much money will you need in Lhasa? ¥409 ($61) is the average daily price for traveling in Lhasa. The average price of food for one day is ¥151 ($23). The average price of a hotel for a couple is ¥451 ($67). Additional pricing is in the table below. These average travel prices have been collected from other travelers to help you plan your own travel budget. Lhasa is the famed capital of Tibet, and is one of the most fascinating cities in the world to visit. It's name means "Land of the Gods" and the city dates back more than 1,300 years. It's elevation is 3,650 meters above sea level, making it one of the highest cities in the world. It sits on the northern slopes of the Himalayan Mountains by the Lhasa River and is the second largest city on the Tibetan Plateau after Xining. Lhasa's high elevation gives it a cool, semi-arid climate. The winters are cold and the summers are mild. The city actually sits in a valley so it is protected from extreme temperatures and strong winds. The coldest month is January when the average temperature is about 29 degrees Fahrenheit and the warmest month is June when the average is 60 degrees Fahrenheit. July through August is the rainiest season, but the rain falls mostly at night so this is a good time to visit. Travel restrictions for foreigners to Tibet are constantly changing. You must thoroughly research current restrictions prior to your trip, and continue to follow current events during your travels. Restrictions can be subject to sudden and abrupt changes. There are many sites within Lhasa but the most famous, and most frequently photographed, is the Jokhang Temple. It was built in the 7th century AD and has been enlarged several times since. It is now a beautiful four story building in the Barkhor Square. Other sights around Lhasa include the Potala Palace, the Norbulingka Summer Palace, Drepung Monastery, Sera Monastery, the Tibet Museum and the Barkhor Street market. The Barkhor Street Market encircles the Jokhang Temple and has many vendors selling fascinating Tibetan items. Bartering here can be a fun experience, as is people watching. This area makes up a major part of the kora, or walk around the temple that worshipers make during prayer. There are areas that have a distinctly Buddhist and Tibetan feel, while in other neighborhoods it is difficult to distinguish Lhasa from any other Chinese city. There is a striking difference between the eastern and western sides of the city. Eastern Lhasa has an atmosphere that is far more Tibetan and traditional. This is most concentrated around the areas of Jokhang and the Barkhor neighborhood. Here you will find traditionally dressed locals worshiping at Buddhist shrines. There are many prayer wheels sprinkled throughout this area as well. On the western side of the city you will notice a more typical Chinese, or Han, culture. This area is more chaotic and hectic. It can be surprisingly modern and is hard to distinguish from any other Chinese city. Head to this area if you're looking for a bank or any form of official business. There are a variety of interesting cultural activities that you can enjoy while you're in Lhasa. Langma Opera is a traditional Tibetan song and dance show that is worth experiencing. If you would like to relax, then a blind massage is available at the Medical Massage Clinic on Bijing Middle Road. This is a project of Braille Without Borders. Near the Jokhang Temple you will find some nice restauratns that offer good food. There are options that range from western cuisine to Nepali, Indian, or traditionally Tibetan dishes. One popular restaurant with backpackers is Makye Ame. It offers traditional Tibetan food and is found on the southeast corner of Barkhor Street. Small, more traditional Tibetan restaurants are the most affordable, and more interesting option when compared to tourist restaurants. There are many Tibetan restaurants in Barkor and on the main streets to the Sera and Drepung monasteries. Central Lhasa is easy to walk around and most of the city's tourist sights are found in this area. It's also possible to pick up a cycle rickshaw in most places but you should negotiate the price before accepting the ride. Taxis are available as well for a fixed rate. Most taxi drivers will pick up several passengers if they find people heading in the same direction. Public buses are available, but visitors rarely use them. You can also rent bicycles at many of the city's hotels are cycle shops. This a fun way to explore the city independently. If you're looking for some interesting souvenirs, head to the stalls around the Barkhor. They're interesting to wander around but you do have to weed out the trinkets before you can find some true gems. Skip the bronzes and paintings, almost none of which are authentic. The better options are the carved pieces, bowls, stamps. and silver. Do consider what you're buying if you choose to because sometimes it's best to leave the authentic antiques in Tibet where they can remain part of the culture and history. For paintings head to a workshop on one of the backstreets so you can meet the artist and even see the painting being painted. This will be a more memorable experience.